The sturdy-burly figures of this set elicit associations with the rings and roots of Tolkien's world. Are they escapees of Middle-Earth or distant relatives of the Hobbits? The Hobbits gave old gifts to old friends. The older the friendship, the more ancient the gift. A well-worn gift was a sign of deep love. Let us not forget that the Christ child is our oldest and most precious gift. 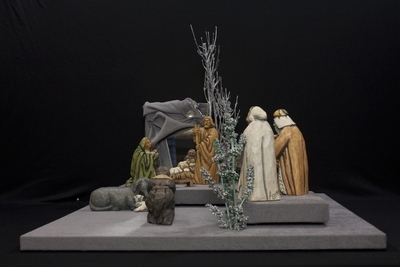 Painted resin figures depicting the nativity of Jesus, created by Anthony Costanza. The exact date of creation is unknown. Exhibition label originally written by Fr. Johann G. Roten, S.M. for exhibit entitled "At The Manger" and held at Roesch Library, University of Dayton.